Located on downtown Kingston's waterfront, the Merchant Tap House is set in a historic building from 1836. Businessmen Dave McNamara and Dave Scatchard purchased what was then Merchant Macliam on March 31, 2005. Dave McNamara has owned and operated restaurants and pubs for over 15 years. Dave Scatchard is a retired National Hockey League player, currently residing in Phoenix, Arizona. He had a successful career in the NHL from 1993 - 2011. 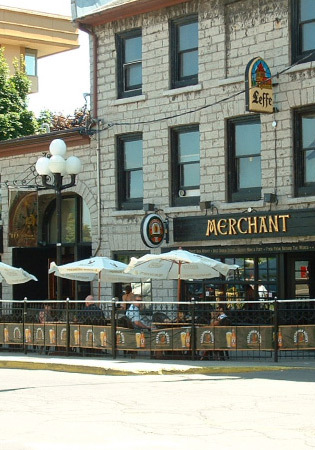 The Merchant Tap House offers customers a choice of over 25 draught beers. Our menu offers a crowd-pleasing variety of pub favourites and classic specialties, including Merchant's Fish and Chips, Merchant's 40 Creek Whiskey Burger, and the thin crust brisket flatbread. Entertainment is never in short supply with live band performances Thursdays through Saturdays. The Merchant Tap House also features a huge 150 person-capacity summer patio overlooking the lake. Check out our website or Facebook page for daily specials and upcoming events!